Quite a while ago… I think Emery was around one year old… I came home from an outing somewhere and hubby declared, “Oh yeah, and I trimmed Emery’s hair”. Mommas, help me out here… it IS a big deal, right? It was a really minor trim and really didn’t look that different but still, a mother needs to know about these things! 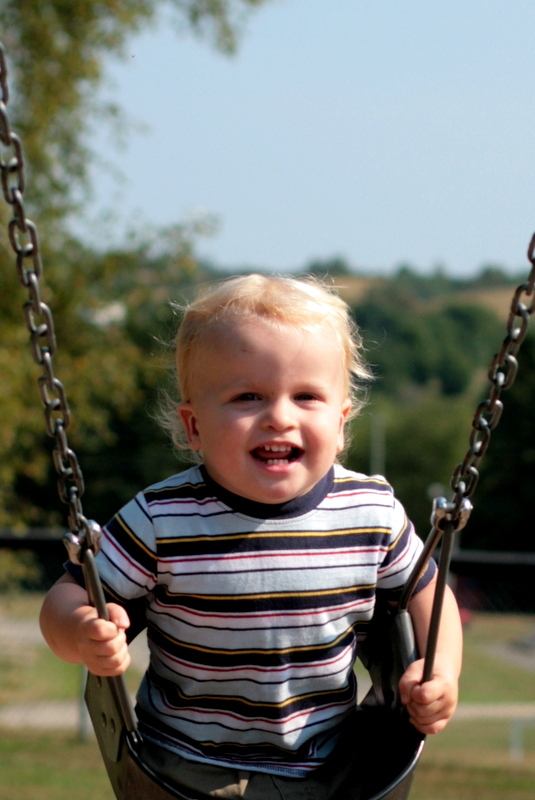 There’s the mental preparation for the fact that your baby… your BABY!… is old enough to need a haircut in the first place, the fact that his looks are going to change, and of course you have to save a few curls if you do that sort of thing. “Well… no, but it’s laying on top in the garbage can”. So I put a few of those curls into the baby book and that, technically, was his first haircut. Skip forward to this week and it really was time for Emery’s hair to be cut. Like really cut. It was super cute and blonde and curly but could get kind of wild at times. I was ready for it. 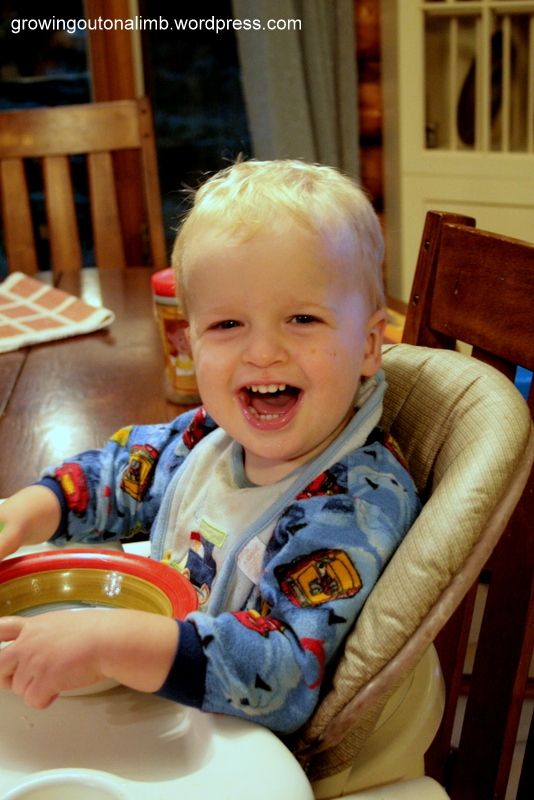 And here he is the morning after what we will call Emery’s first “little boy” haircut. I’m getting used to it but even three days later I am still shocked at how much it changes his looks. I was with Oliver’s first haircut too though. 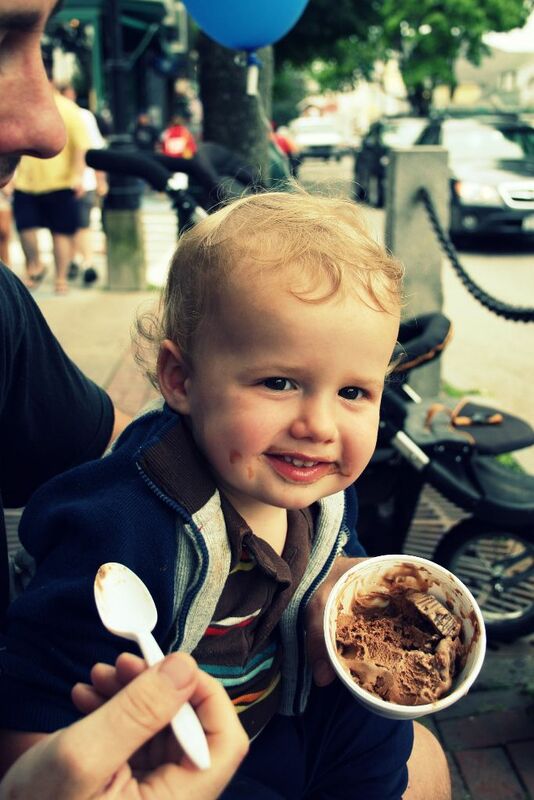 All of a sudden he doesn’t look like my baby anymore but like a toddler… my little boy. It doesn’t matter that he’s saying all the same words he did yesterday, doing the same things, playing the same way… he’s the same Emery. But cutting that hair off feels like saying goodbye to my baby somehow. Of course he’s still super cute. 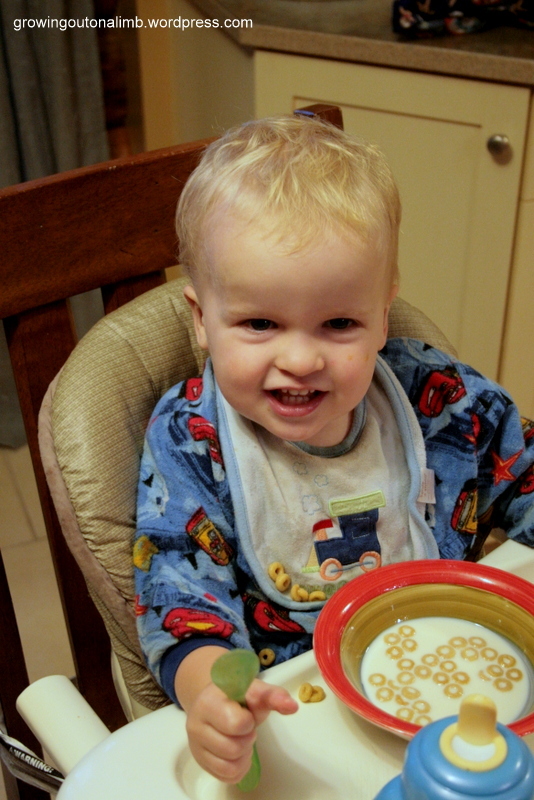 And of course he doesn’t give a flying fig as long as I keep the cheerios coming. And I know it’s just hair and all that and the time was going to come around sooner or later. But somehow it IS a big deal… a really big deal. 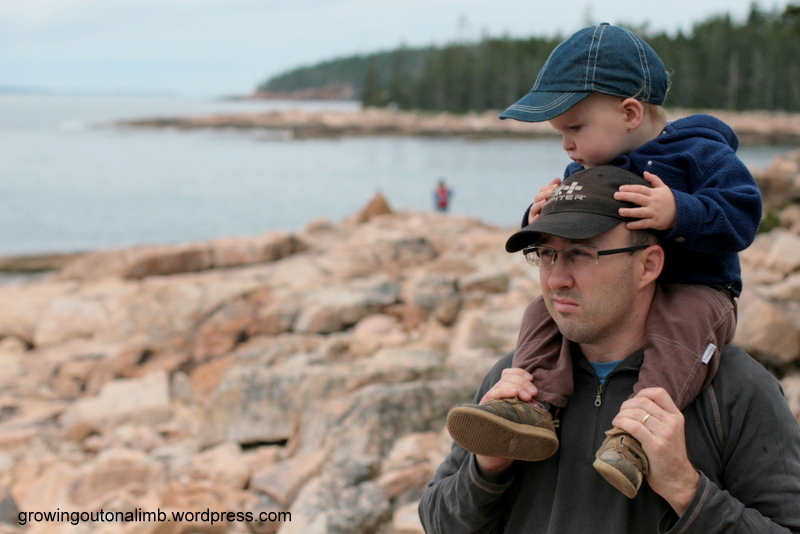 Categories: Emerson, Firsts, Musings as a mom | Permalink. Papa has been into running for quite a few years now, doing half marathons all over the place. 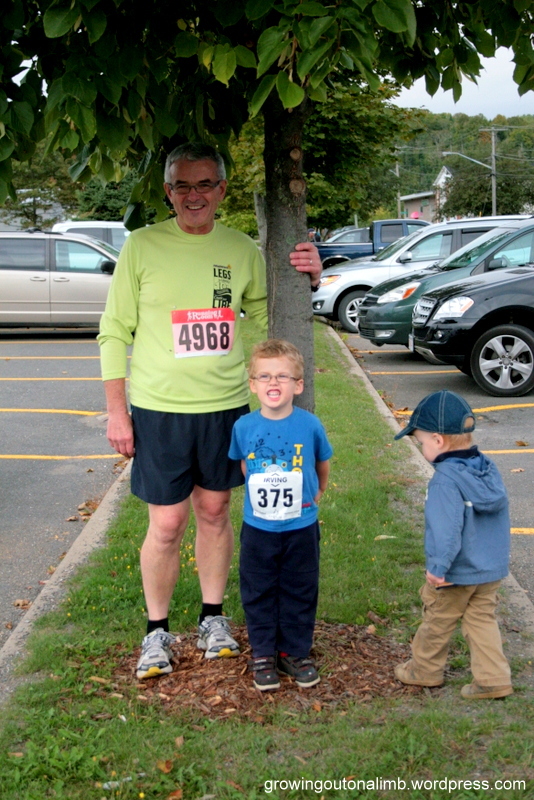 When he heard the local fall fair has a 2-, 5-, and 10-K race, he thought it would be fun to get Oliver in on the action. 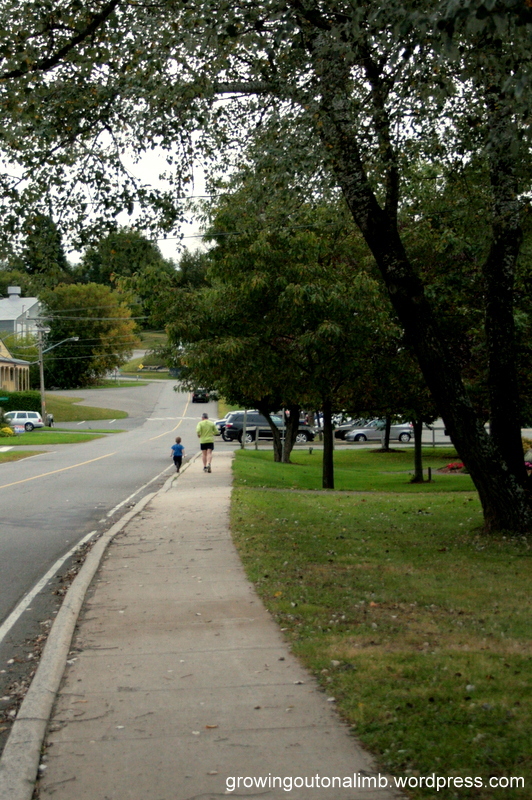 The plan was to run their own little race, just over a half mile. So, being the awesome Papa that he is, he found a numbered bib (this race didn’t supply their own), he brought a medal from one his previous races, and he even thought to have a crepe paper finish line. How cool is he?! He was so excited. We have talked about it for weeks, including the few minutes leading up to the race, and Oliver sounded excited too. Unfortunately, Oliver is Oliver. Wait… I don’t mean that quite the way it sounds. See, Oliver is kind of an introvert and he’s pretty stubborn and that means when he makes his mind up it takes an awful lot to change it. It’s pretty frustrating at times, but we love him for every part of who he is and have learned that there are ways to approach certain situations to make him more accepting. I thought I had done everything right in this case. But he noticed the little crowd gathering around the start line and decided about three minutes before race time that he wasn’t having anything to do with it. I’m pretty sure he thought he and Papa were going to have a race at Papa’s house, not in town and surrounded by a bunch of people he didn’t know. So he dug his heels in. We tried our best to convince him to run but he was pretty adamant. 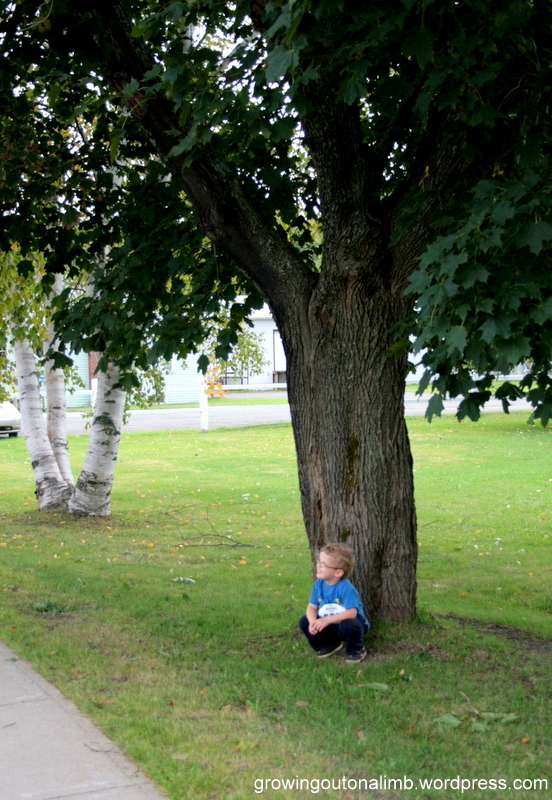 Eventually he saw Emery start to run with Papa and that’s what finally got him into gear. So he did run part of the way. I’m glad he tried it so maybe he won’t be so scared to try it the next time. About halfway back he declared that he needed a rest. And here are the runners at the finish line (with Emery trying to hone in on the glory). I felt pretty bad that my dad had put so much thought and effort into something special for the two of them and Oliver’s initial reaction wasn’t very accepting. But he was understanding of it all and hopefully will try again next year. I hope so because I love to see them finding common interests and spending time together. Categories: Family Fun, Firsts, Oliver | Permalink. I love the idea of harvest… of reaping what we sow. Mind you, my garden could have yielded better results this year but that’s not the point: the idea of growing food to feed my family is so basic and pure and so satisfying to me. Even if it isn’t grown by me, putting those jars of preserves on the shelves of my pantry feels like I’m doing my family such a great service. I haven’t done as much this year as in past years but I do what I can with the time that I have and have decided to be accepting of that. 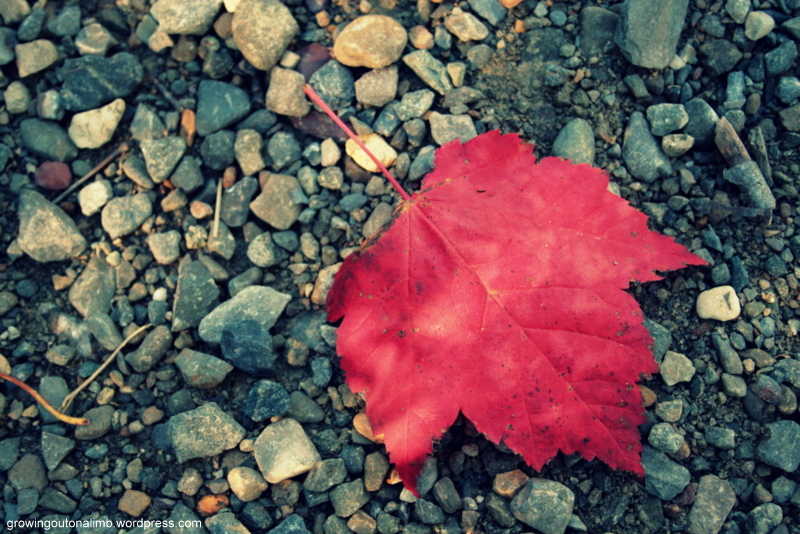 And I love seeing the trees change color. The cooler temperatures don’t bother me, even if they take a few weeks to get used to, because I like winter. I can’t imagine living somewhere that doesn’t get snow and four clear seasons. Of course it is more cumbersome to dress everyone in sweaters and pants but that’s okay… it’s practice for getting the snowsuits on and off. These are just a few shots from a week ago, playing around outside. 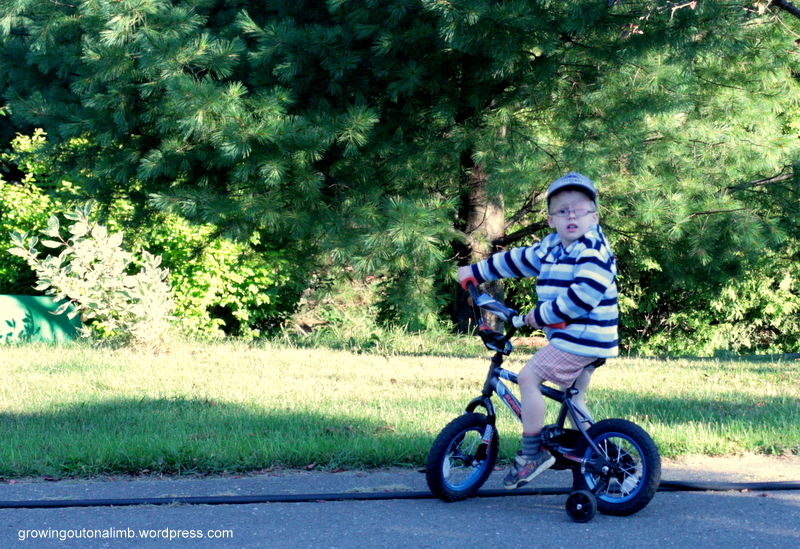 Oliver doesn’t spend a lot of time on his bike but he likes to get on it more and more. We learned today that we won’t need to patch Oliver anymore for now so that’s good news! Speaking of glasses, this little guy needs them. We’re just waiting for the call to say they’re in. You can bet a cute picture will follow after that. 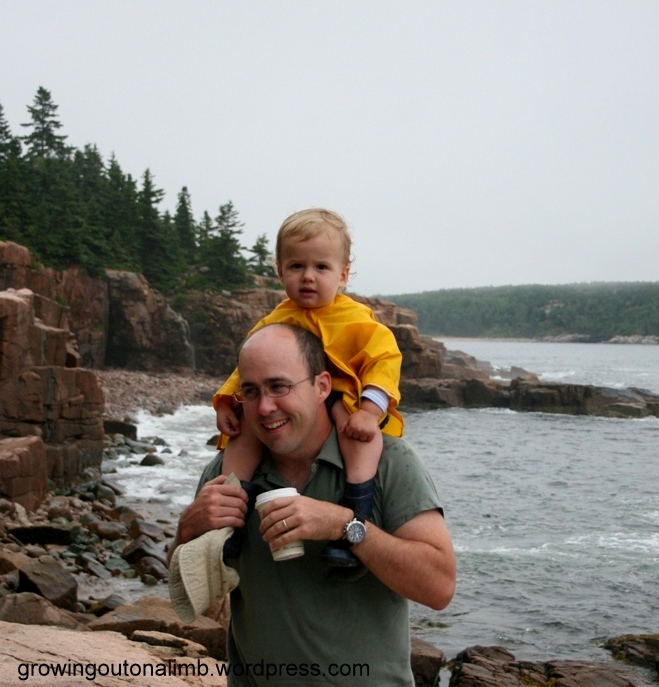 Categories: Emerson, Fall, Oliver, Playtime, The Great Outdoors | Permalink. 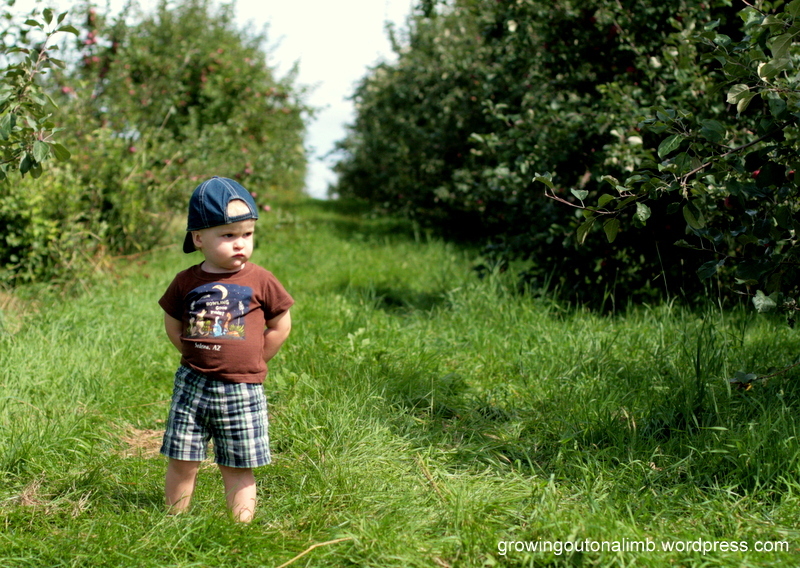 Last year, for a variety of reasons that all worked against us, we missed our annual trip to the apple orchard. We went on a beautiful Saturday afternoon and were told that the U-pick had closed just two days earlier. Bummer. I was not going to miss it again. In fact, this year we jumped the gun a bit and went just after the U-pick opened and only three varieties were ready. But that’s okay. 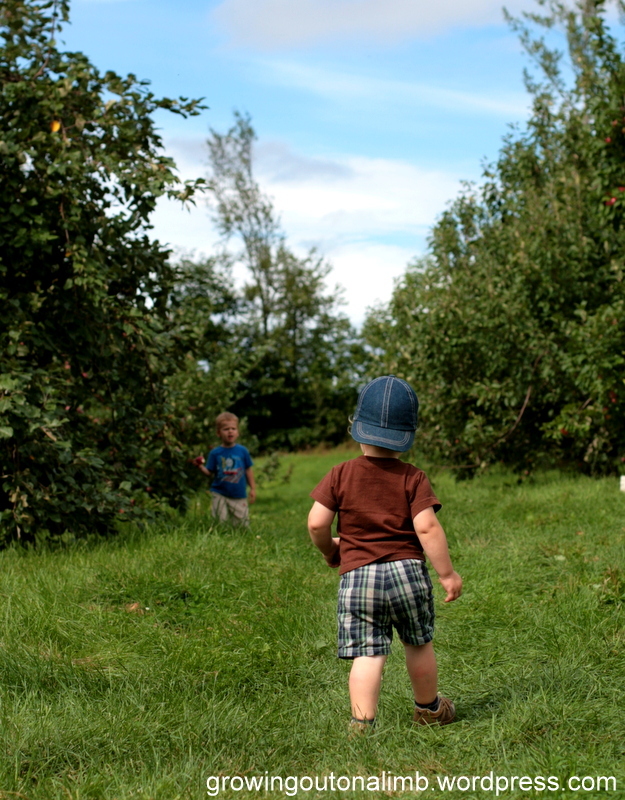 It was a beautiful day and we came home with lots of delicious apples so no complaints here. Emery was a little sleepy and sober from the drive. His stare can be so deep and intense sometimes. Oliver was very keen to be helpful. 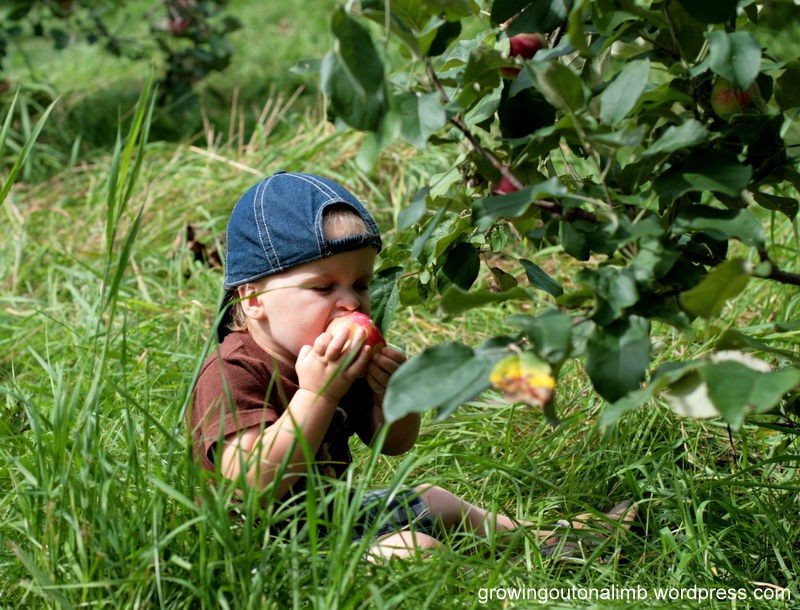 This year he really seemed intrigued by the idea that the apples were hanging on the trees! 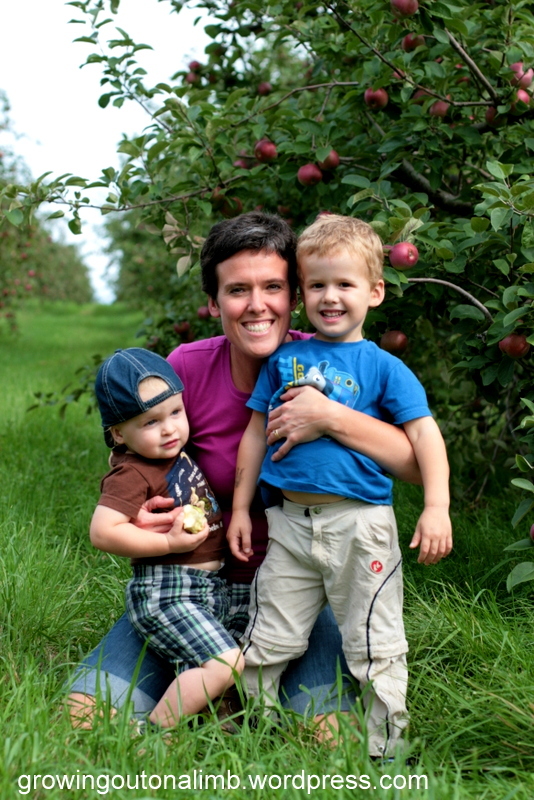 Apple picking is about family time, yes. It’s about doing something fun outside, yes. But it is also about teaching our kids where real food comes from… I think that’s important and it’s neat to see Oliver grasping that and curious about it. Of course both of them had their fair share of apples along the way. 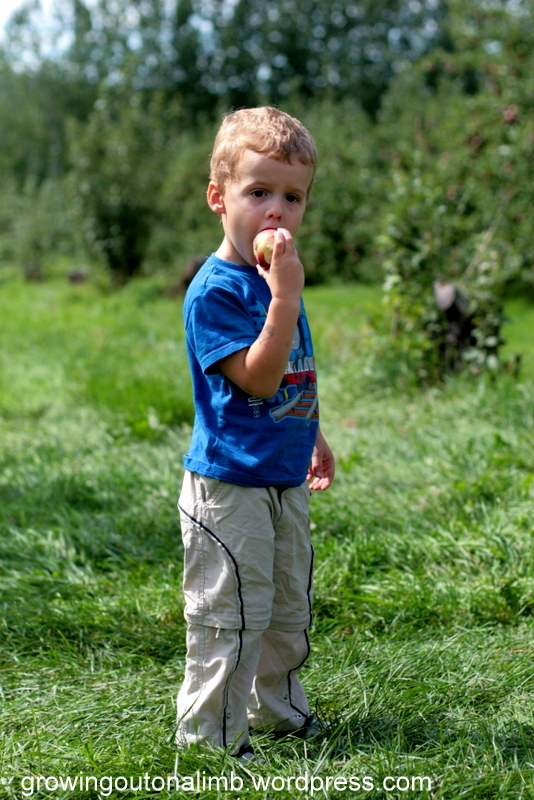 Oliver must have had two or three apples while we were there and yet, as we were leaving, he said, “I need a snack!”. What a boy. I laughed and said, “Honey… you just had your snack. Right off the tree!”. It’s a great place to run around! The first picture of the boys and I since mother’s day of last year! 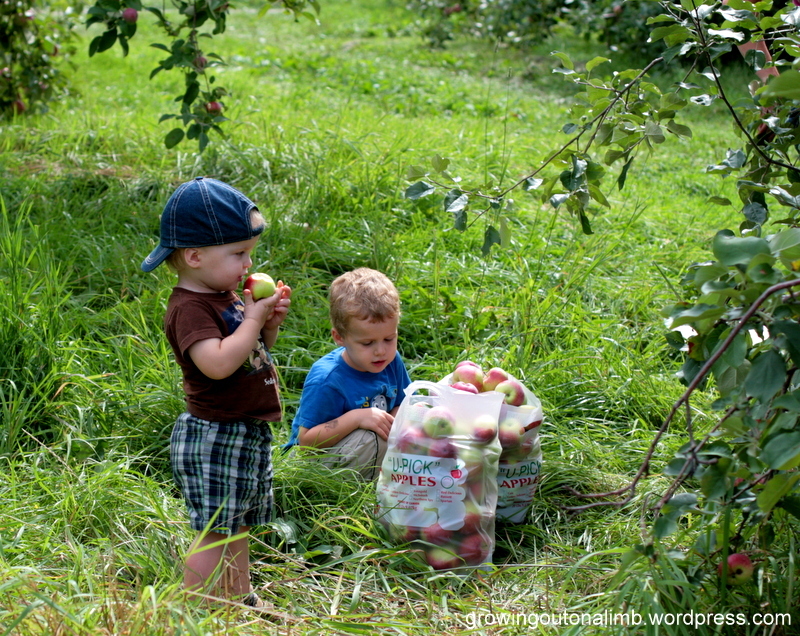 We always have fun at the orchard… one of my favorite family traditions! 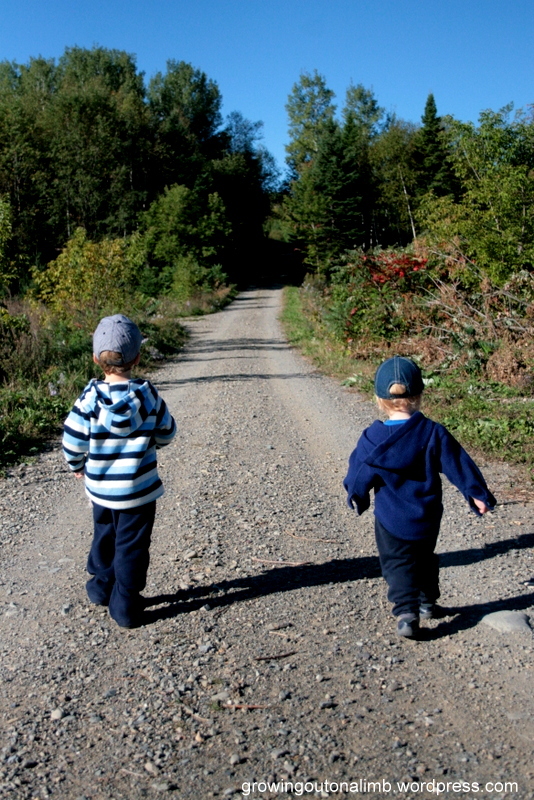 Categories: Fall, Family Fun, Oliver, Outings, The Great Outdoors | Permalink. 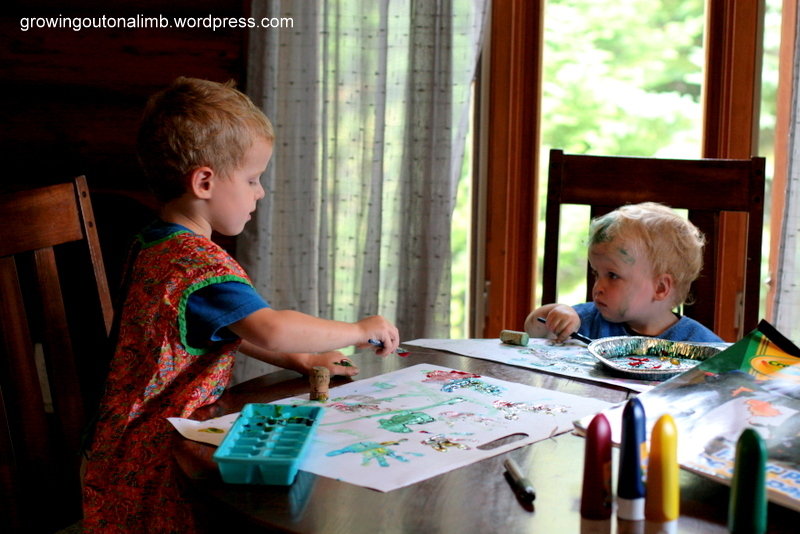 Yesterday morning we were hanging out at home and dug out one of our favorite past times… painting! Oliver loves it. He is finally past the stage of mashing all the colors together into that pukey gray tone, so his creativity comes through more and more. And of course Emery has to be in on all the action. 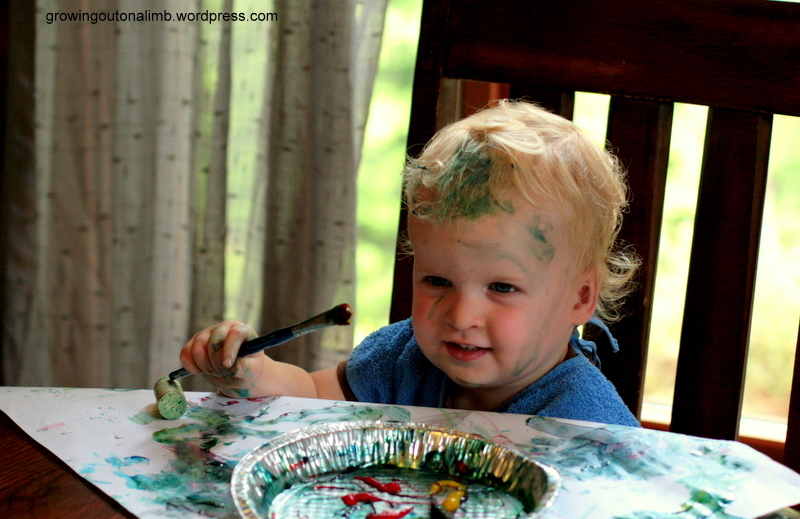 And I don’t mind: towels on the dining room chairs, aprons over their shirts, and washable paints make it worry free in terms of cleanup. Oh and hair. Hair is also washable. I swear I was paying attention to something Oliver was doing for just 20 seconds and turned around to that. Oh well, as long as he’s having fun! Categories: Craftiness, Emerson, Oliver, Playtime | Permalink. 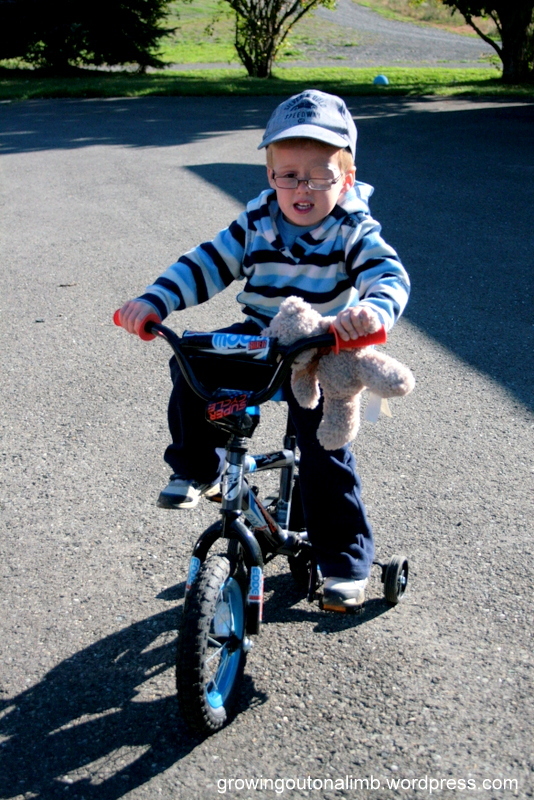 We bought a bicycle for Oliver at Easter but he was very resistant to get on it. He always chooses kicking a ball or running over the bike, I think mostly because he just doesn’t see very many kids on bikes so doesn’t get what they’re all about. Finally, after pointing out several kids on their bikes in different places and scenarios, he is asking to go out and play on his bike . We haven’t in a while but we used to talk about Oliver’s day right before he fell asleep, as a way to help calm him down and recollect things from his day. 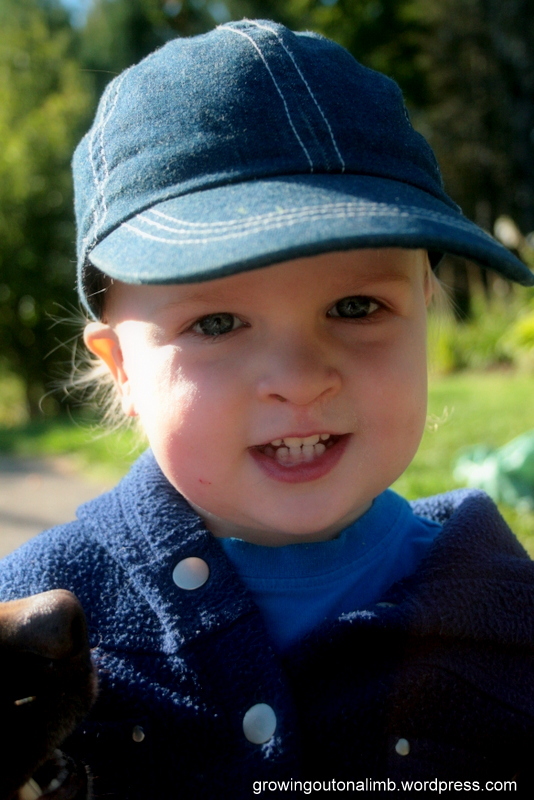 This particular day our sitter, the lovely Jean, told me that Oliver had bumped his head while playing outside that afternoon. Nothing unusual, nothing to worry about. Oliver: “Yeah. 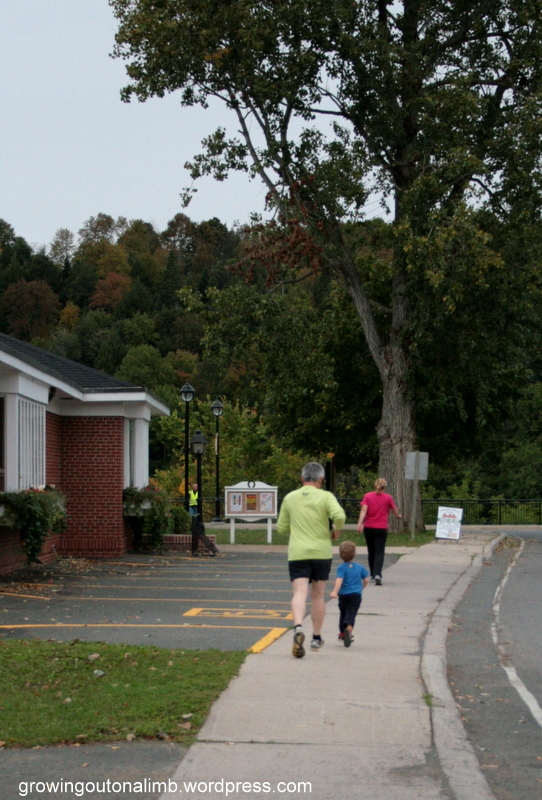 I was running and my legs were going too fast and my head bumped into the playhouse”. I tried my best not to laugh out loud. 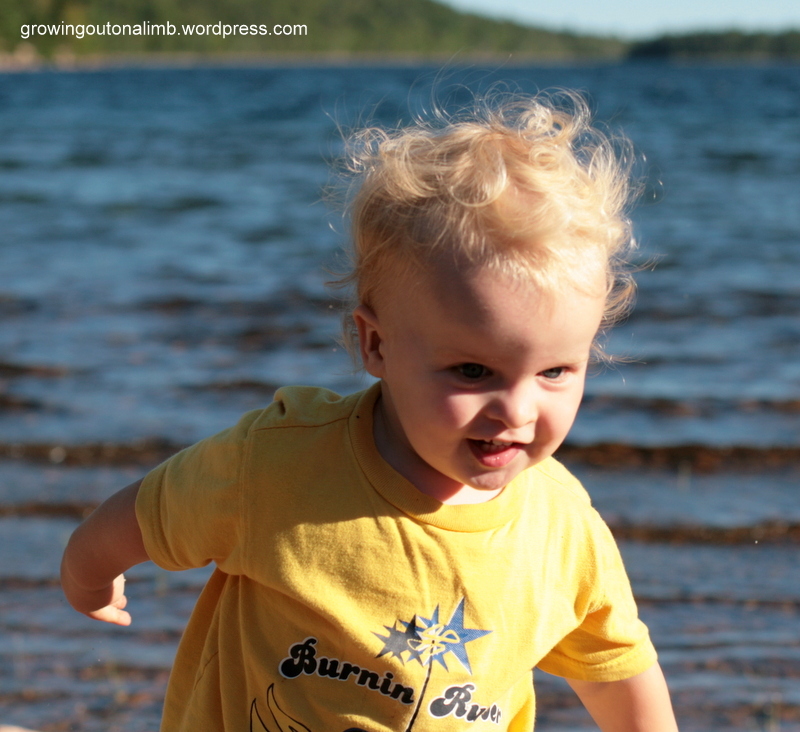 Categories: Firsts, From the mouths of babes, Oliver | Permalink. 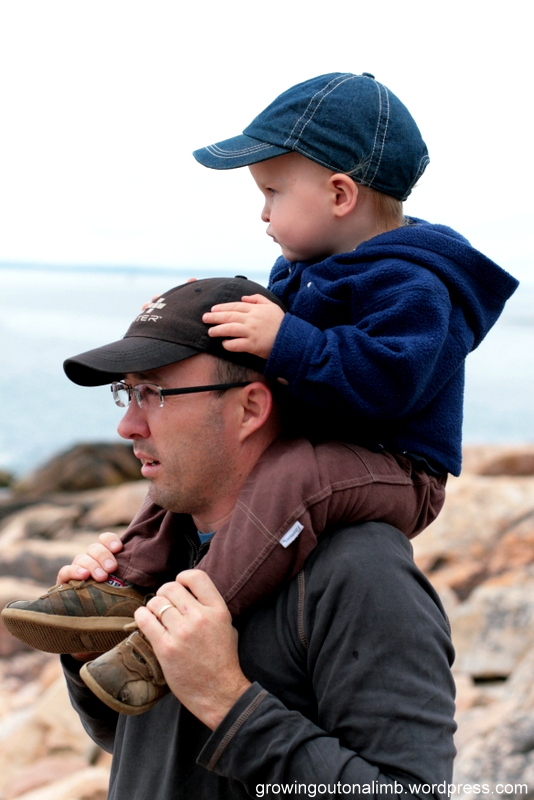 … reminded me of these pictures taken on our last trip to Bar Harbor, when Oliver was about the same age as Emery is now. Hmm… they really don’t look that much alike but when you compare them side by side at similar ages I’m reminded that there is quite a resemblance! 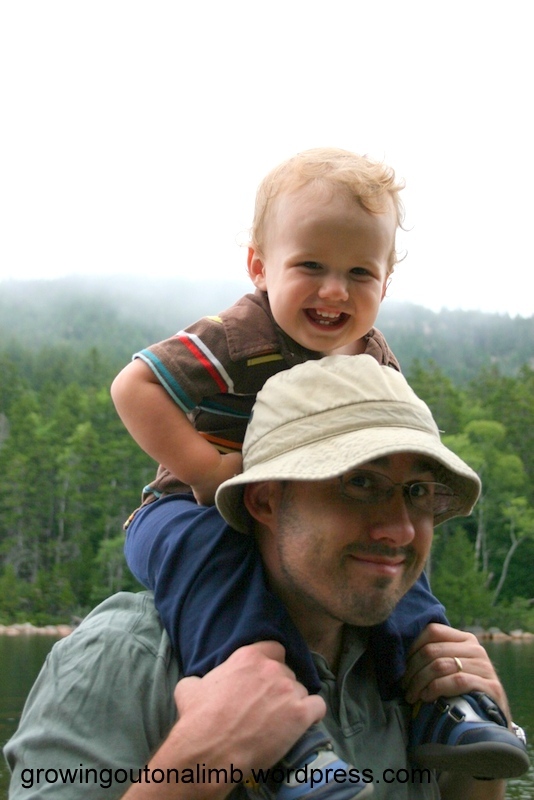 Categories: Emerson, Me and My Daddy, Oliver | Permalink.